VIDA blog’s Australian Women Writers Challenge book reviews continue with Deb Lee-Talbot’s analysis of an Australian women’s history classic. Patricia Grimshaw, Marilyn Lake, Ann McGrath, and Marian Quartly, Creating A Nation: 1788-1990 (Ringwood: Penguin, 1994), ISBN 0-14-025905-8 (paperback). As an optimistic bibliophile, I have the inclination to bring home more books than I could possibly have time to read. 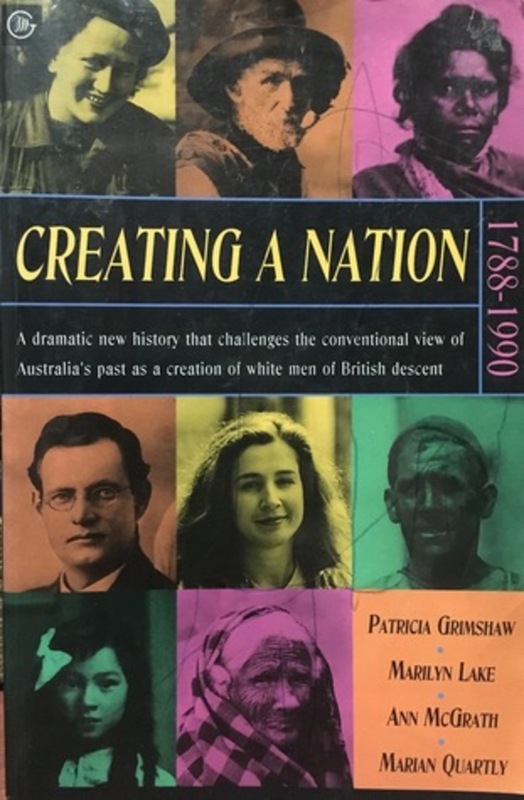 Therefore, I was grateful for the opportunity offered by the Australian Women Writers Challenge to return to Creating a Nation: 1788-1990 (1994), the scholarly classic by Patricia Grimshaw, Marilyn Lake, Ann McGrath and Marian Quartly. 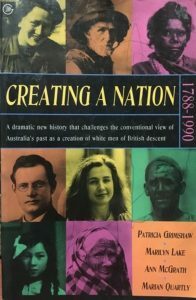 Creating A Nation has been notable since its publication: it won the 1994 Human Rights Award for non-fiction and was shortlisted for the 1996 Adelaide Writer’s Prize. Creating a Nation is co-written by four prominent Australian historians, who use a feminist framework to construct an alternative perspective toward Australia’s history, previously dominated by the presence and perspective of British white males. While historical textbooks often offer detailed vignettes concerning ‘history from below’, Creating a Nation was the first national historical study written from a feminist perspective. Each chapter is written by an individual, yet the consistent theme is to consider the impact of women-driven social movements upon the environmental, social, cultural, political and economic landscapes of Australia. Today, Ann McGrath is a Professor of History at Australian National University, Director of the Australian Centre for Indigenous History and 2017 recipient of the Kathleen Fitzpatrick Laureate Fellowship. Her research uses extensive archival research and oral history to expose the stories of marginalised Australians, for which she was awarded an Order of Australia medal in 2007. Marian Quartly is Professor Emerita of Australian history in the Monash School of Philosophical, Historical and International Studies. Since retiring from academia in 2006, Quartly has continued to research Australian women’s history, with a focus on family, religion, gendered citizenship, and the ways in which ‘truth’ is constructed. Patricia Grimshaw, a Professor Emerita at the School of Historical and Philosophical Studies at the University of Melbourne, explores the histories of feminist and aboriginal issues within the Pacific and Australasia. Although officially Grimshaw retired in 2006, she remains active in academia and was appointed an Officer of the Order of Australia in 2017 for distinguished service to the social sciences and to the humanities. Marilyn Lake is a Professor Emerita at the School of Historical and Philosophical Studies at the University of Melbourne. 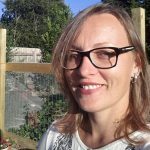 Her research has shaped discussions about Australian history and nationalism; gender, war and citizenship; feminine and masculine identities; history of feminism; race, gender and imperialism; and global and transnational history. The Avengers (1869), by S.T. 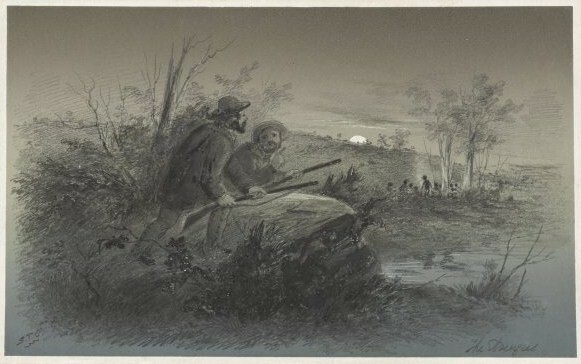 Gill, illustrates the close proximity and contention between Aboriginal and British settlers, which led to complex and often violent relations. Image via Wikimedia Commons. One particularly outstanding element is how well this collaboration of authors wrote fluid yet separate chapters. McGrath’s chapters (1, 6 and 12) focus on Aboriginal historical experiences and Quartly’s chapters (2, 3 and 4) present historical narratives about the colonies between 1788 and 1860. Grimshaw’s chapters (5, 7 and 8) create a framework through which to conceptualise Australia from Federation to 1912, whilst Lake’s chapters (9, 10 and 11) finally focus on the more recent twentieth-century history. Admittedly, I was unable to acquire the revised 2004 edition, which has an additional chapter. The following review focuses on a chapter from each author which I found to be the most engaging, informative and thought-provoking. McGrath begins Creating a Nation with the chapter ‘Birthplaces’. This chapter sets the tone for the book, juxtaposing dominant with marginal groups. It begins by charting the intercultural experiences of Aboriginal and British and men and women. McGrath invites readers to perceive how cultural misunderstandings occurred between distinct social and cultural groups through the birthing stories of Warreweer, a Wangal woman, and Barangaroo, a Cammeraygal woman. Specifically, Barangaroo’s birthing story details how the Governor of New South Wales, Arthur Phillip, denied her birthing at Government House. This was, McGrath explains, an attempt to incorporate the British into Aboriginal kin networks which was declined by Phillip due to the distinction from British ‘laying in’ processes. Importantly, McGrath demonstrates how Australia’s national narrative must move beyond recognition of 1788. Rather, readers are drawn in to read about a specific time frame; when Aboriginal Australians were primary landowners and the pivotal moment when the balance of power between Aboriginals and Britons changed, was yet to come through ‘clearing, ploughing and building works’ which had ecological as well as social impact (22-24). 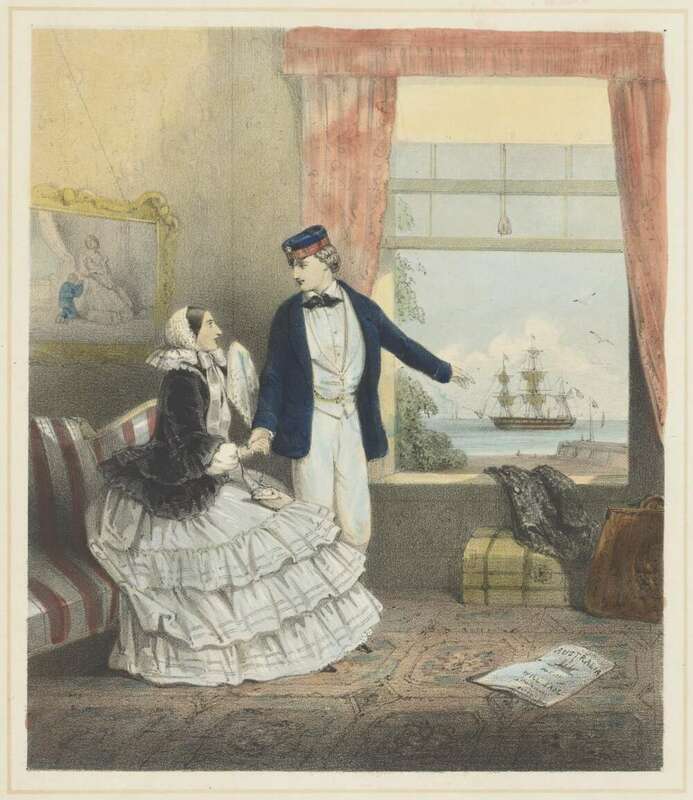 Women were convinced life would be improved in Australian colonies, thus they arrived as indentured labourers as depicted in The Emigrant (c. 1850). Image via National Library of Australia. Quartly’s chapter, ‘Making Male and Female Worlds,’ focuses on the debates occurring during the 1830s. Specifically, Quartly demonstrates how increasing condemnation of convict transportation alongside the maintenance of arguments supporting the emigration of the British create a foundation for the Australian colonies (79). Crucially, emigrants came to replace convict labour, leading the white population to surpass the Aboriginal population (79). Detailing the history of women such as Mrs Phillip Parker, Quartly demonstrates how women laboured for independency. Parker married for the first time in 1827; and having four children, she married again after her husband died, this time to the mentally unstable George Bruce Barton in 1836. Parker became the sole provider of the family by ‘writing the first children’s book published in the colony,’ A mothers offering to her children (1841). Unlike contemporary narratives of bunnies and crayons on adventures, A mothers offering consisted of ‘blood thirsty tales of shipwreck and murder, made moral by occasional references to province’ (80). Quartly subsequently illustrates how women were believed to be social redeemers and foundation for a stable and moral colony. The story of Caroline Chisholm especially gives the reader the understanding the moral and social value of women, with ‘good’ women within the colonies having ‘the power to civilise men through love’ (83-89). Significantly, it is through Chisholm’s story that readers are provided insight into the ways in which women’s mobility was often limited to marriage or domestic service and their experiences of domestic abuse (94). There were many spaces from which women were excluded, such as the political sphere, where men – from landholders to working citizens – contended for dominance (94-102). Grimshaw’s ‘Contested Domains’ continues the trend of utilising individual narratives to explore marginalised Australian history, this time between the 1880s and 1890s. The stories of Louisa Lawson and Bessie Harrison Lee are threaded through the chapter to demonstrate political public demands for social justice and the dominance of white peer issues (151). Lawson, editor and publisher of the Dawn, the first recorded women’s journal in the Australian colonies, also inaugurated the Women’s Suffrage League. The Melbourne-based Lee, having been raised by alcoholics, became involved in the Woman’s Christian Temperance Union, which exposed the ‘consequences for women of widespread alcohol abuse by men, not only in frontier communities but throughout urban society’ (173). Here, Grimshaw astutely notes, Aboriginal-Australians were made absent from multiple reform agendas while white Australians debated the meaning and significance of the public and private spheres, as well as the roles of men and women within each (154). Grimshaw powerfully demonstrates limited, white, feminist discourses at play within late-nineteenth-century Australia (167-170). In ‘Giving Birth to the New Nation,’ Lake considers how twentieth-century social debates and legislative reform constructed white women as valuable contributors to Australian society. At this time, Australian women sought social change with the institution of a maternity allowance (205-6). As with previous social welfare reforms, Lake demonstrates the conscious exclusion of ‘Asiatics’ and ‘Aboriginal natives of Australia, Papua of the island of the Pacific’ (206). While there were some Australians which argued ‘maternity is maternity whatever the race,’ they were amongst the minority (206). Accordingly, Lake critically examines how Australia’s maternity debates became sites for the expression of racial social anxieties. Significantly she highlights how white women, regardless of class, ethnicity or age, became idealised parents with policy endorsing the removal of Indigenous children from their parents and placement within white families (201). Yet, Lake also takes the opportunity to explore how white women also became subjects to paternalistic policy. Specifically, maternal and infant care institutions were initially conceived as space ‘run for and by women independent of the male medical establishment’ however state regulation and legislation subjected women to the medicalised gaze of male experts (227-228). Lake concludes her chapter by showing the continued economic oppression of Australian mothers who, unlike the ANZAC soldiers who were generously provided a pension, did not gain the motherhood endowment (229). 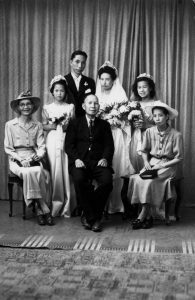 Wedding of Philip and Edith Leong, including bridesmaids and family (1944). 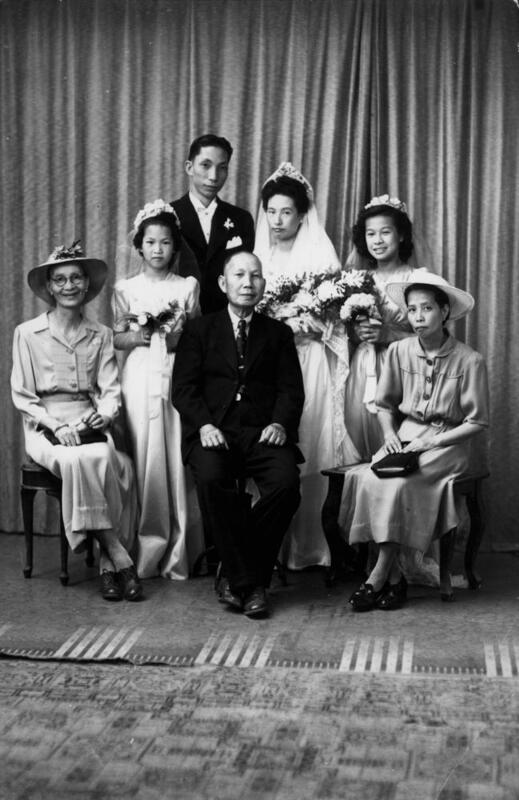 Image via John Oxley Library, State Library of Queensland. Overall, Creating a Nation presents a multifaceted vision of Australian history whereby race, gender, class and ethnicity are illuminated as categories of contention. It also demonstrates how women, as companions or individuals, became drivers which influenced our modern society (153). I greatly enjoyed a theme throughout the book which revealed how Australian women authors, such as Louisa Lawson, Ada Cambridge, Rosa Praed, and Miles Franklin utilised print media to promote social change. The focus on these authors also reveals how silences occur in Australian history, as women from marginalised groups, being undocumented or without archives often remain unrecognised by contemporary society. As a junior researcher, this book is still relevant for combatting the persisting silences of marginalised populations within Australian history. After reading this book I found myself considering how little my fellow students refer to Creating A Nation, as well as how thought-provoking it remains for new history, gender and cultural studies authors despite being over 20 years years old. The history which McGrath, Quartly, Grimshaw and Lake created continues to challenge authors to represent diverse Australian narratives based upon gendered, LGBTQ, rural, urban, immigrant, Aboriginal, and local perspectives – without relying on the traditional silences or binaries upon which mainstream Australian history too often falls. This book offers the starting point for authors who wish to challenge hegemonic society – much as Lawson, Cambridge, Praed and Franklin did – to create spaces for new and innovative national discourse discussions. Creating A Nation is a highly valuable text for anyone interested in an inclusive understanding of the development of Australia as a nation. I greatly admire the authors’ treatment of various cultural, political, and economic discourses across a range of generations. Together these women created a balanced and well-researched book. The disruption of the dominant white male perspective of Australian history creates a space to value the diverse peoples which did, indeed, create a nation. Deb Lee-Talbot is completing a Bachelor of Arts (sociology) at Deakin University. Deb is also a volunteer with Melbourne Museum, researching historic Australasian expeditions. Her primary research interests are religion, gender, Australian and Pacific history. Follow Deb on Twitter @socialquery101. This entry was posted in AWW book reviews. Bookmark the permalink.